Gout has been a known medical condition for centuries. In fact, the first known mention of Gout was in 2640 BC by the ancient Egyptians. Records also show that the legendary Greek physician Hippocrates referred to Gout as the "Unwalkable disease" showing how disabling this complex form of arthritis can be. Gout is typically characterized by bouts of sudden pain and swelling in the joints throughout the body, although it is most commonly found in the big toe. These symptoms occur when needle like crystals of Uric acid form around the joint stopping it from moving freely. In some cases the acid can also form lumps under the skin surrounding the joint. The excess Uric acid associated with Gout is also known to affect our kidneys and can lead to the formation of kidney stones. Conventional treatment for Gout involves taking medications such as non-steroidal anti-inflammatory drugs (NSAIDs), steroid medications and Colchicine. 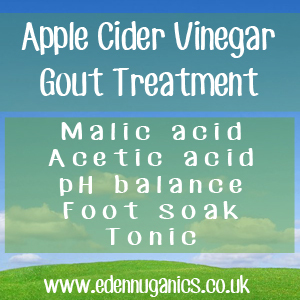 How does apple cider vinegar help with Gout? ACV breaks up the formations of Uric acid in our joints, as well as preventing them from reforming, by increasing blood circulation and purification. Another key substance found in apple cider vinegar is Acetic acid. This acid, once digested, helps to alkalise your body, helping to form an environment unsuitable for the formation of Gout crystals. Apple cider vinegar can also be used to treat kidney stones that often accompany severe cases of Gout. The best way to included apple cider vinegar in your diet is by starting your day with a couple of tablespoons mixed with warm water. This natural health tonic will not only help to treat Gout, but offer your whole body a vast range of benefits to keep you and your family feeling great. Combine warm water and raw honey and stir until the honey has completely dissolved. Next we are going to add some organic ACV. Around three tablespoons is recommended. Drink this while warm before your first meal of the day. Drinking this on an empty stomach is the best way to receive the maximum benefit of this remedy. The first thing you will need is a clean bowl big enough to take your affected foot. Fill the bowl with warm water and add around a cupful of raw apple cider vinegar. Allow your feet to soak in this solution for around 20 minutes before allowing to dry naturally. This process can be repeated once a day while suffering from pain or swelling. What type of vinegar should I use? Be sure when buying apple cider vinegar never to buy processed or pasteurized varieties as these have been heated to high temperatures and left void of many of the therapeutic ingredients. Instead, look for bottles that are unfiltered and still in their raw state. Avoid refined sugar and white breads.